Befriending The Dragon, hand-drawn mandala, Minneapolis, Minnesota, June 2008, photo © 2008 by QuoinMonkey. All rights reserved. 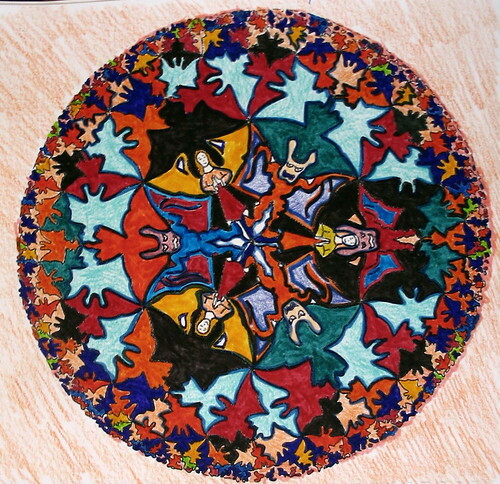 ONE: Hand-drawn mandala incorporating the internal conflict and fight of the Dragon. 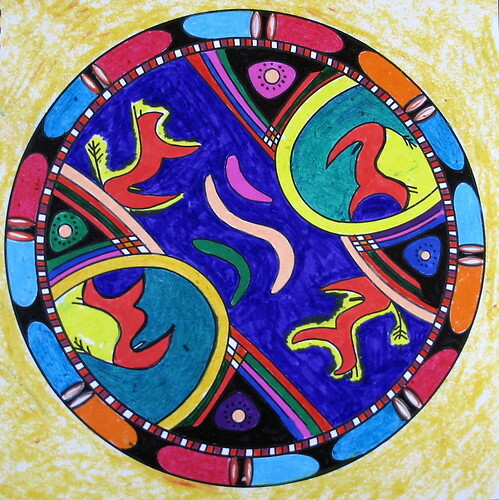 Started as a blank circle, drawn with a black Sharpie, and colored with Crayola markers, Portfolio Brand Water-Soluble Oil Pastels, and Reeves Water Colour Pencils. Eye Of The Beholder II, Minneapolis, Minnesota, June 2008, photo © 2008 by QuoinMonkey. All rights reserved. 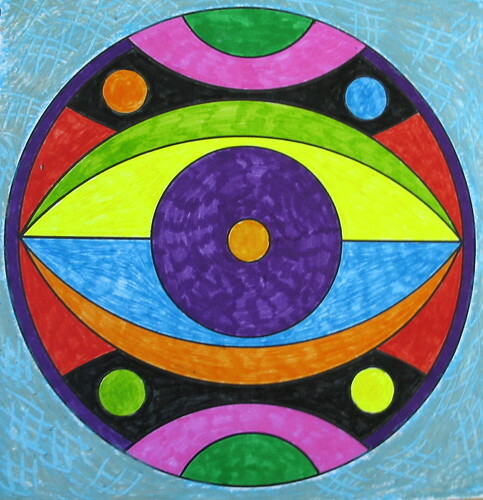 TWO: The eye at the center of this mandala signifies the Ego, the part of you that you call “I.” The birth or rebirth of Ego happens many times during your life as the understanding of your relationship to yourself, and others, changes. Escher’s Dragons, Minneapolis, Minnesota, June 2008, photo © 2008 by QuoinMonkey. All rights reserved. THREE: Dragon Fight brings about polarization of opposites: dark and light, male and female, angel and devil. Increased inner conflict creates energy that can be channeled into expansion of consciousness. The drawing is based on M.C. Escher. Mother Earth, Father Sky, Minneapolis, Minnesota, June 2008, photo © 2008 by QuoinMonkey. All rights reserved. FOUR: A new viewpoint emerges when you endure the tension of opposites during conflict resolution in Stage 6. Opposites are incorporated into one another as Mother Earth, Father Sky. Or the white and black of the Yin Yang symbol. Solutions to conflict bring something entirely new to the situation, something you may not have thought of prior to that moment. Animal Spirit Guides, Minneapolis, Minnesota, June 2008, photo © 2008 by QuoinMonkey. All rights reserved. FIVE: Dragon Fight is experienced during adolescence and other transitional periods as a new phase in your life. Tribal peoples heighten the normal fear and stress of young people to intensify their initiation into adulthood. Initiates are given secret teachings about the animals that serve the tribe as helpers and guides to the Spirit World. This mandala design was inspired by designs on the creation of ancient pottery and based on an illustration by Marija Gimbutas, The Language of the Goddess. I bet you thought I’d never get June’s mandalas posted. Here’s how it goes — I get the mandalas done, but then need to work them into the energy and timing for the posts; it’s time to publish June’s mandalas! The theme for the 6th Stage of The Great Round is Dragon Fight. 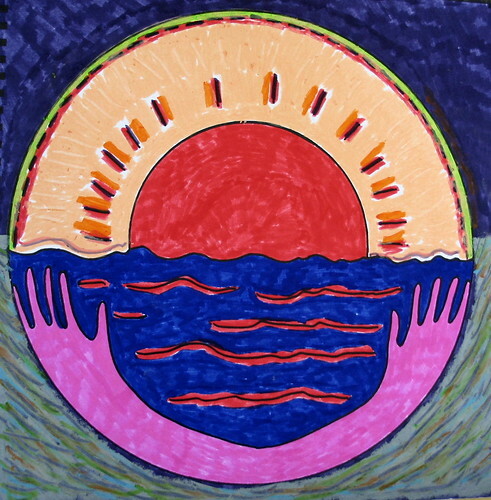 We began Coloring Mandalas as a practice in January, working with the archetypal circle, and following the twelve passages of Joan Kellogg’s The Great Round. June’s mandalas are colored and drawn with Crayola markers, Portfolio water-soluble oil pastels, Reeve’s Water Colour Pencils, and a black Ultra Fine Point Sharpie (Sharpies are my favorite writing and drawing utensils). Dragon Fight takes you face to face with your own internal demons. When you are young, Dragon Fight plays out in adolescent conflicts and helps you separate from your parents, or the tribe or community in which you grew up. You find yourself wanting to break out of traditions; tension increases, issues are polarized, until a new psychological perspective is generated. As adults, transitions in midlife can bring you around again to the stage of Dragon Fight. On the spiritual level, the 6th Stage is concerned with working through contradictions in belief systems, until your own spiritual footprint emerges. With Dragon Fight behind me, Stage 7 falls at High Summer, in the month of my birth. I’ll be traveling over much of July and have a few mandalas left to color for the next stage. Maybe I’ll create a few of my own while I’m on the road. Powerful stage, QM. 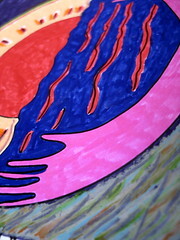 I wonder if while coloring the mandalas and reflecting on what each stage represents, do things come up? What are those experiences like? “Befriending the Dragon” has a lot of energy. 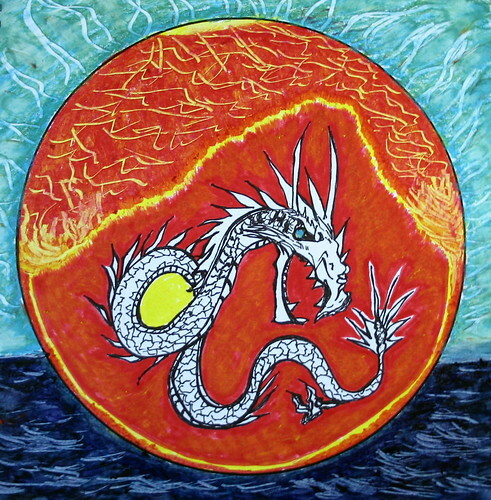 A dragon contained within a circle of fire, contained within a bubble, floating on an ocean. That’s what I see. The eye is all knowing. I’ve noticed quite a few eyes contained in these mandalas. Reminds me of St. Lucy and her eyeballs on a plate — path to clarity. ybonesy, I think most of what comes up isn’t conscious. I might have an initial reaction to the detail or symbols or not want to work on a particular mandala. But I just do it anyway. Once I start, none of that matters. I forget what I’m doing and the subconscious takes over. It’s all color and shape and old symbology. Yes, lots of eyes in these. Clear seeing. Maybe it’s kind of like some of the writing retreats. We kind of went and wrote and sat with everyone and we didn’t really know how much we were changing until later on. Whatever is happening, the practice feels good to me. It’s time consuming but I am enjoying it. I’m committed to doing it for a year. And to see where it leads. It did seem like the Dragon symbology had a little different energy. Things kind of bumping up against each other. A search for competing energies to balance. Yin and yang. Those inner conflicts that move us along, they remind me of Monkey Mind. Ever present. Stunning. The colors and images have me memorized. What incredible work, I’m at a loss for words. Wow, this is the kind of art I love, bold, bright colours with an immediate impact…..my faves were 3 and 5, though they’re all fab. Stevo, thank you for your kind words. Jo, bold and bright, they sure are. I am attracted to bold bright colors right now. Energetic and passionate. Thank you. I do like hearing what people’s favorites are because they are different for everyone. We are all drawn to different symbols. And diddy and I were talking in the waiting room about how amazing it is for several people to color the same mandala and to see how different they turn out, all due to chosen color. I think I posted a few of those at the beginning of the year. Liz and I worked on the same one. She’s usually drawn to more pastels and less contrast. Does anyone know where I can find a mandala that has 4 dragons, 2 cranes, the sun, & the ocean in it?